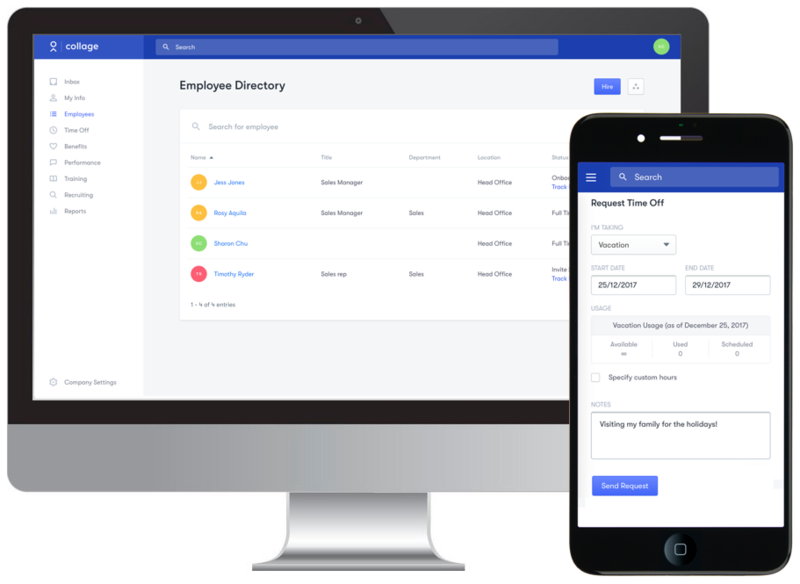 We’re thrilled to announce the launch of Collage 2.0 - the newest version of our HR management platform. It’s packed with new features, moves with you from device to device and lays the foundation for the future of our platform. Here's a summary of all the changes below. All new responsive design for desktop and mobile. Teams collaborate at the office, from home, and everywhere in between. It’s time HR did, too. Collage 2.0 can be used across any desktop or mobile device. No need to download or install any apps, just open your favourite browser and get started. Global search is more than your average search bar. 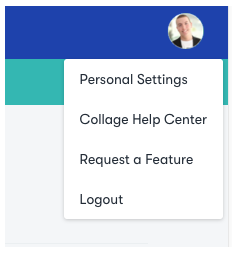 It’s a faster, more intuitive way for admins and employees to navigate Collage. Start typing anything you’re looking for across the platform, and we’ll direct you to it. Start typing in what you are looking for and it will return categorized results to more easily find what you are looking for. Common examples include searching for an employee, requesting time off, or jumping to a report. Create your own documents to be signed or viewed by people during onboarding. Documents can be edited in Collage to dynamically include data like a person's name, an executive's signature or dates like when a document was signed. Once documents are signed or viewed, they are automatically added to the person's profile. It's common to have company documents like an employee handbook or company policy that all employees need access to. Now you can save a ton of time by simply uploading a company document and assigning it to existing employees. 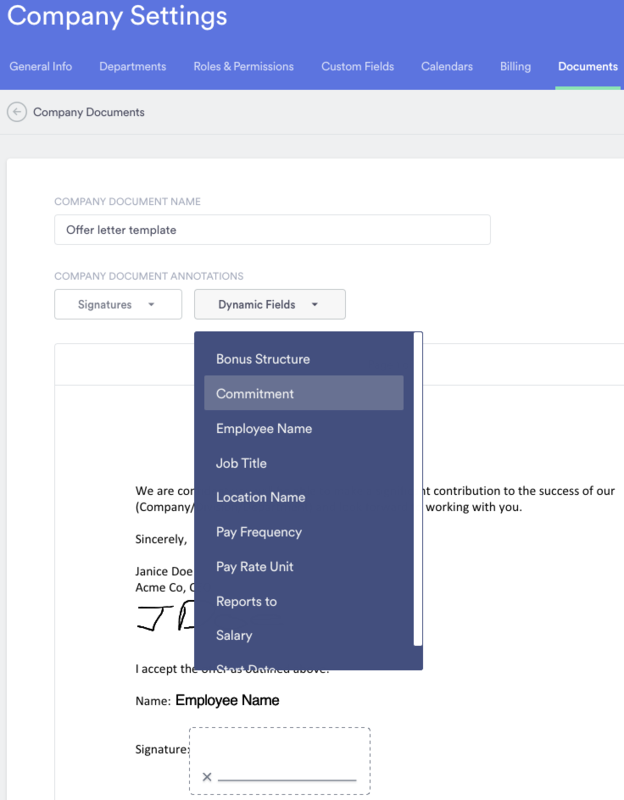 Just like onboarding documents, you can dynamically insert employee information and signatures. Once assigned, employees are notified of a task to complete by either signing or marking as read. Completed documents are saved to the employee's profile under documents. Odds are you have forms that every employee needs to download, fill out, scan and submit to their manager or HR. 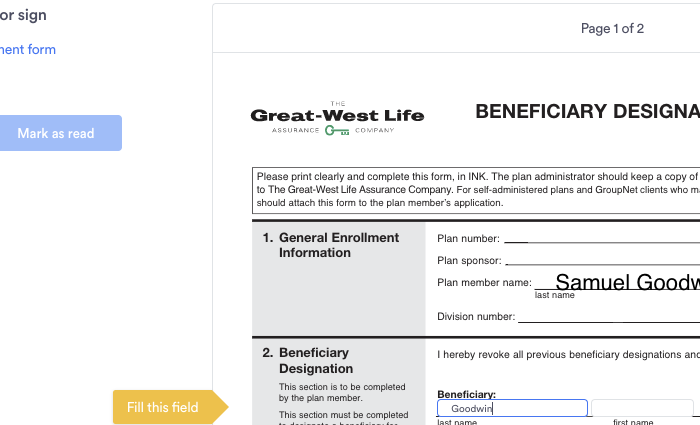 Now you can upload these forms (must be a .PDF file) and add fillable fields for the employee to complete digitally. 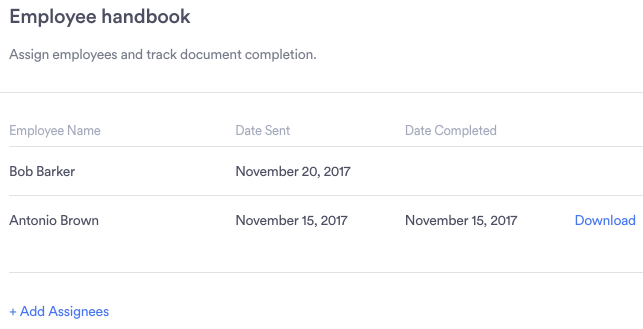 Turning a PDF into a fillable form is just another part of annotating a PDF so you can have employees fill them out during onboarding or assign to existing employees. People with time off requests to action receive a daily reminder. People overdue for a Check-in with their leader receive a daily reminder. People with tasks due the next day, today, or overdue receive a daily reminder. 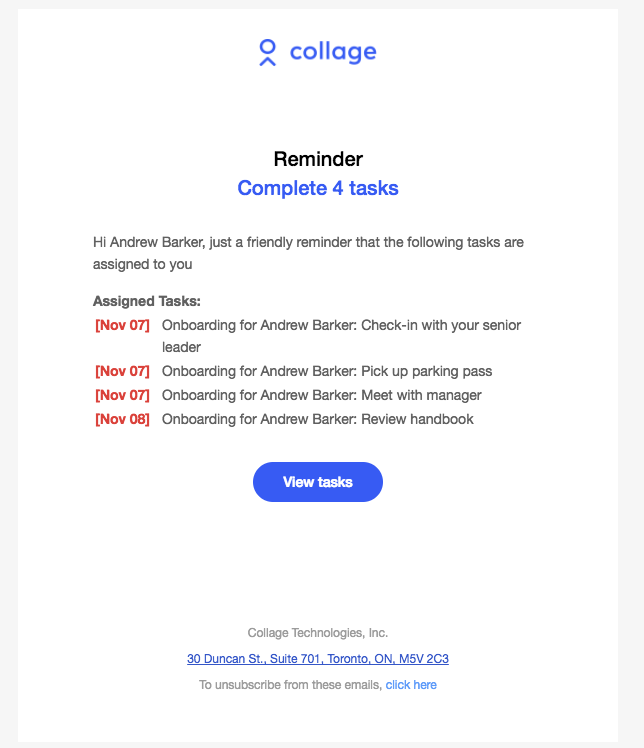 Task reminders are grouped so you never receive more than one per day. Reminders only send Monday to Friday. Create email reminders for any custom date field to track things like when an employee's work visa expires. You can set up multiple reminders to do things like, "Notify the employee 3 months before expiration" and "Notify HR 1 month before expiration". 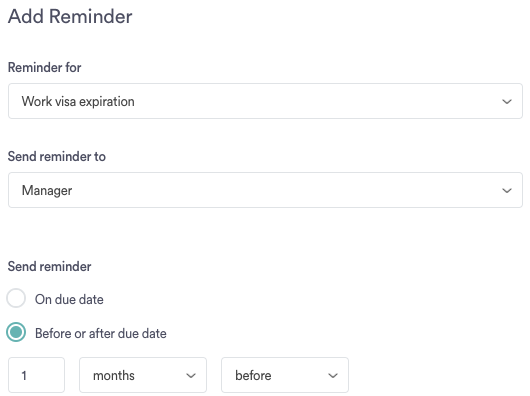 Reminders are available under Company Settings and you can read more about using them to track expiration dates here. Types of time off can now be setup with 3 different approval options. Auto approve - Great for executives or work from home days. Approval required - What exists today. Usually a single approval from the manager. Two stage approval - Great for when HR needs to also weigh in on an employee taking time off. Approvals are configurable for each type of time off within a policy. We love talking to customers, especially about how our product can better help you take care of your people. Now you can submit your product feature requests and ideas directly to the Collage Product Team. Fixed an issue causing employees to see stat holidays they shouldn't. Now they will only see holidays available to them (based on location). The issue did not impact an employee's vacation days taken during stat holidays, only the viewing of them from their profile. Updating a person's manager no longer triggers a payroll update. Fixed an issue where a terminated employee would cause the viewing of a Check-In cycle to crash. Terminated employees are now automatically removed from a Check-In Cycle. Fixed an issue causing email links to log in not recognizing the employee's language preference. Now when an employee click a link in a Collage email, the log in page will load using the employee's language preference. Fixed dependency issues preventing the deletion of departments. Fixed dependency issues preventing the deletion of Locations.